(Nanowerk News) In a new study, a team led by André Hoelz, an assistant professor of biochemistry, reports the successful mapping of the structure of the symmetric core of the nuclear pore complex (NPC), a cellular gatekeeper that determines what molecules can enter and exit the nucleus, where a cell's genetic information is stored. The study appears in the April 15, 2016 issue of the journal Science ("Architecture of the symmetric core of the nuclear pore"), featured on the cover. The findings are the culmination of more than a decade of work by Hoelz's research group and could lead to new classes of medicine against viruses that subvert the NPC in order to hijack infected cells and that could treat various diseases associated with NPC dysfunction. "The methods that we have been developing for the last 12 years open the door for tackling other large and flexible structures like this," says Hoelz. "The cell is full of such machineries but they have resisted structural characterization at the atomic level." The NPC is one of the largest and most complex structures inside the cells of eukaryotes, the group of organisms that includes humans and other mammals, and it is vital for the survival of cells. It is composed of approximately 10 million atoms that together form the symmetric core as well as surrounding asymmetric structures that attach to other cellular machineries. The NPC has about 50 times the number of atoms as the ribosome—a large cellular component whose structure was not solved until the year 2000. Because the NPC is so big, it jiggles like a large block of gelatin, and this constant motion makes it difficult to get a clear snapshot of its structure. In 2004, Hoelz laid out an ambitious plan for mapping the structure of the NPC: Rather than trying to image the entire assembly at once, he and his group would determine the crystal structures of each of its 34 protein subunits and then piece them together like a three-dimensional jigsaw puzzle. "A lot of people told us we were really crazy, that it would never work, and that it could not be done," Hoelz says. Last year, the team published two papers in Science that detailed the structures of key pieces of the NPC's inner and outer rings, which are the two primary components of the NPC's symmetric core. 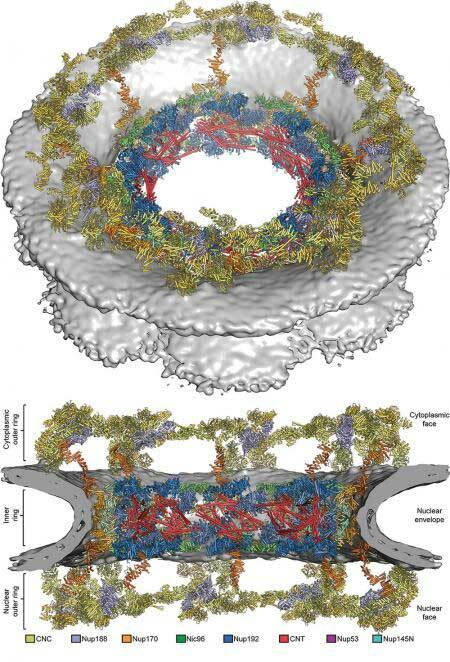 The donut-shaped core is embedded in the nuclear envelope, a double membrane that surrounds the nucleus, creating a selective barrier for molecules entering and leaving the nucleus. By being able to piece these crystal structures into a reconstruction of the intact human NPC obtained through a technique called electron cryotomography—in which entire isolated nuclei are instantaneously frozen, with all of their structures and molecules locked into place, and then probed with a transmission electron microscope to produce 2-D images that can be reassembled into a 3-D structure—"we bridged for the first time the resolution gap between low-resolution electron microscopy reconstructions that provide overall shape and high-resolution crystal structures that provide the precise positioning of all atoms," Hoelz says. With these structures known, the mapping of the rest of the NPC's symmetric core came quickly. "It is just like when solving a puzzle," he says. "By placing the first piece confidently, we knew that we would eventually be able to place all of them." As described in the new paper, Hoelz's research group now has solved the crystal structures of the last remaining components of the symmetric core's inner ring and determined where all of the rings' pieces fit in the NPC's overall structure. To do this, the team had to first generate a complete "biochemical interaction map" of the entire symmetric core. Akin to a blueprint, this map describes the interconnections and interactions of all of the proteins, as part of a larger cellular machine. The process involved genetically modifying bacteria to produce purified samples of each of the 19 different protein subunits of the NPC's symmetric core and then combining the fragments two at a time inside a test tube to see which adhered to each other. The team then used the completed interaction map as a guide for identifying the inner ring's key proteins and employed X-ray crystallography to determine the size, shape, and position of all of their atoms. X-ray crystallography involves shining X-rays on a crystallized sample and analyzing the pattern of rays reflected off the atoms in the crystal. The team analyzed thousands of samples at Caltech's Molecular Observatory—a facility developed with support from the Gordon and Betty Moore Foundation that includes an automated X-ray beam line at the Stanford Synchrotron Radiation Laboratory that can be controlled remotely from Caltech—and the GM/CA beam line at the Advanced Photon Source at the Argonne National Laboratory. "We now had a clear picture of what the key jigsaw pieces of the NPC looked like and how they fit together," says Daniel Lin, a graduate student in Hoelz's lab and one of two first authors on the study. The next step was to determine how the individual pieces fit into the larger puzzle of the NPC's overall structure. To do this, the team took advantage of an electron microscopy reconstruction of the entire human NPC published in 2015 by Martin Beck's group at the European Molecular Biology Laboratory (EMBL) in Heidelberg, Germany. The images from Beck's group were relatively low resolution and revealed only a rough approximation of the NPC's shape, but they still provided a critical framework onto which Hoelz's team could overlay their atomic high-resolution images, captured using X-ray crystallography. The NPC is the largest cellular structure ever pieced together using such an approach. "We were able to use the biochemical interaction map we created to solve the puzzle in an unbiased way," Hoelz says. "This not only ensured that our pieces fit in the electron microscopy reconstruction, but that they also fit together in a way that made sense in the context of the interaction map." Hoelz said his team is committed to solving the remaining asymmetric parts of the NPC, which include filamentous structures that serve as docking sites for so-called transport factors that ferry molecules safely through the pore and other cellular machineries that are critical for the flow of genetic information from DNA to RNA to protein. "I suspect that things are going to move very quickly now," Hoelz says. "We know exactly what we need to do. It's like we're climbing Mount Everest for the first time, and we've made it to Camp 4. All that's left is the sprint to the summit."